Delisle manages to capture for us what a non-working foreigner not proficient in the local languages would perceive during his/her time in Rangoon. The heat. I'd always wondered about it. Delisle said his level of tolerance improved over the year he stayed there, so that he could stand up to 90degF before turning on the air conditioner, while when he'd arrived, 80degF was his limit. Delisle's wife works as a physician for Médecins Sans Frontières (MSF) International as a physician, and this time we learn a little about how the process of country-siting is chosen, what kind of conditions employees endure as condition of their employment, and a little about the different roles sister organizations have within the same country. One can actually use this as a window into the work of the organization as well as into the country. All of Delisle's graphic memoirs are interesting. This one made me laugh when he showed a picture of a pen and ink drawn made during 'the wet,' or the rainy season. The lines were all running and blurred, as though it had been dunked in a barrel of water or as if one had spilled water onto it. The rest of the year is 'the hot.' What else is striking is at that time (2006-07), permits were required for foreigners to travel around the country, due to a great deal of internal unrest. Some of the physicians are stationed at remote outposts, and even though the organization is permitted to operate, getting permission to travel to and from those outposts is difficult and can be dangerous. But here the usefulness of having an artist making the trip is apparent. We envision the enormous ancient teak house in Mudan that is rented by MSF, and the local translation of a British village complete with fenced front gardens. 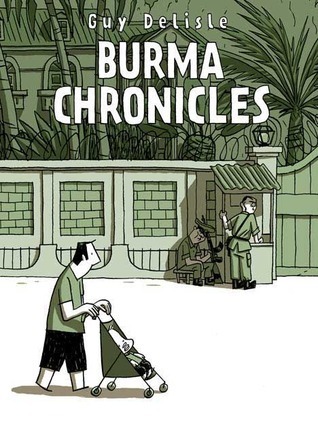 You will remember Orwell was stationed in Burma between the world wars. Anyway, Delisle is not a political writer, nor a journalist, but he adds a heck of a lot to our understanding nonetheless. I'm now officially a big fan. 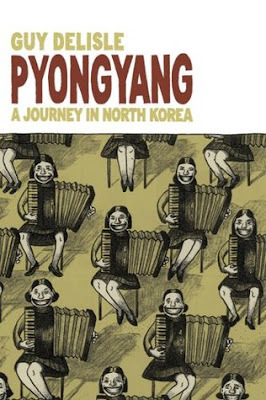 Delisle's Pyongyang experience is a little different from his other books because in the case of North Korea, Delisle is here to work on animation studies for a film. Apparently most major animation studios find animation devilishly expensive to produce in the home country and so go to lower-wage countries to do the in-between frames in a storyline so that the work is smooth and not herky-jerky. Foreigners are asked to come for short periods of time to keep an eye on the project and get the work done on time and with the proper standards. While he was there, Delisle came across a not-insignificant number of people living in Pyongyang or passing through, on their way to remote outposts for different reasons. I'd always wondered about that, but wasn't sure if it actually happened. Must be pretty grim work, considering Delisle's experience ensconced in a big, empty, cold & impersonal hotel in the city...surely as comfortable a place as can be found. Anyway, one gets a very good sense of what his days were like, what the city looked like, how fun was to be had, if it was to be had at all, but very little of the inner lives of residents, which is to be expected. Delisle's work again adds to the richness of our understanding of the world.